Back before Christmas (you remember Christmas don’t you? it seems so long ago now) we finished an HTML5 mobile browser game for the agency BiteCp as part of a Christmas campaign. 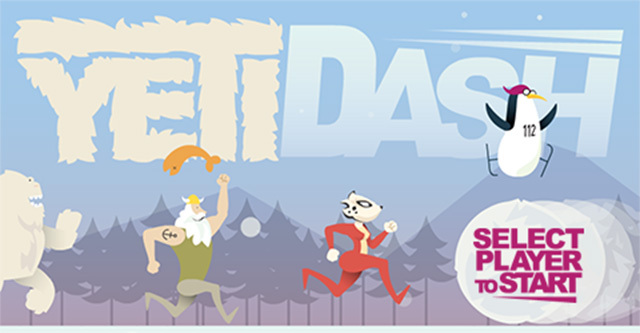 In Yeti Dash you choose from 3 characters: a Viking, a penguin or a snow leopard and control them across a horizontally scrolling snow bound level all the while being chased by a Yeti. 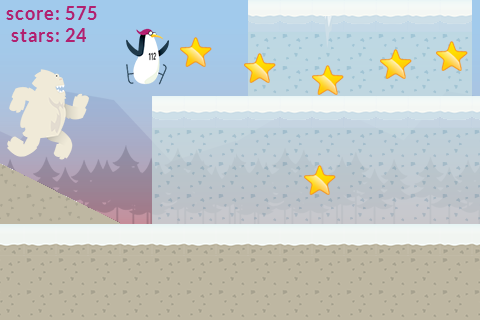 The level is full of ice to speed you up, fish for you to throw at the yeti to slow him down and various things to avoid. And should the yeti catch you.. well, you have to endure some yeti smooching (yes, for real). Originally during development it was a lot quicker to play. 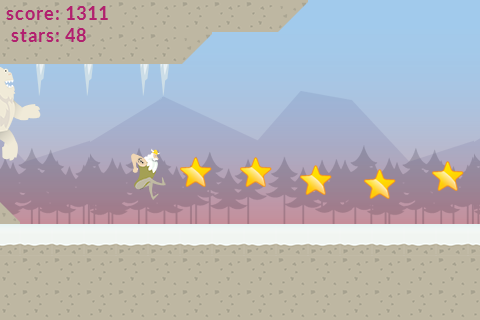 The characters gained momentum from sliding for example and could leap much higher and faster, using the hills almost like ramps to launch themselves from. But these things were removed during tweaking and play testing but we are strongly considering revisiting the old mid-way code base to see if it wouldn’t fit well into a brand new game where speed is essential. Posted on January 29th 2013 at 4:40 pm by Rich. View more posts in Clients. Follow responses via the RSS 2.0 feed. Just out of curiosity, why this game and many of your recent games are made using ImpactJS not KiwiJS? This one was meant to be a re-skin of Nutmeg, which was an impact game, and had a very short turn-around on it. So it made sense to not change framework. None of our BBC games for example use impact and we’re using kiwi actively for a very large game build at the moment, so you’ll see it used in more and more releases as the year goes on.